Humble Bundle and award-winning publisher IDW Publishing, in conjunction with Hasbro, are reteaming to offer the perfect opportunity to build a digital TRANSFORMERS comic collection. Not only does the bundle feature multiple collected volumes of the hit TRANSFORMERS series, it also boasts some of the most recent issues to date, making it easy to catch up to speed on the latest stories. Customers can name their price for the first 37 issues of TRANSFORMERS: More Than Meets the Eye and the one-shot Death of Optimus Prime. Those who pay more than the average price will also receive volumes 1-6 ofTRANSFORMERS: Robots in Disguise as well as TRANSFORMERS: Dark CybertronVol. 1. Customers who pay $5 above the average price or more will receive all of the above plus TRANSFORMERS: Robots in Disguise#33-#37 and TRANSFORMERS: Dark Cybertron Vol. 2. As with all Humble Bundles, customers can choose how their purchase dollars are allocated, between the publishers and charity. The Humble TRANSFORMERS Bundle 2 Presented by IDW supports the Hasbro Children's Fund, which is dedicated to empowering childhood by bringing the sparkle of Hope, the joy of Play and the power of Service into the lives of the children who need it most. 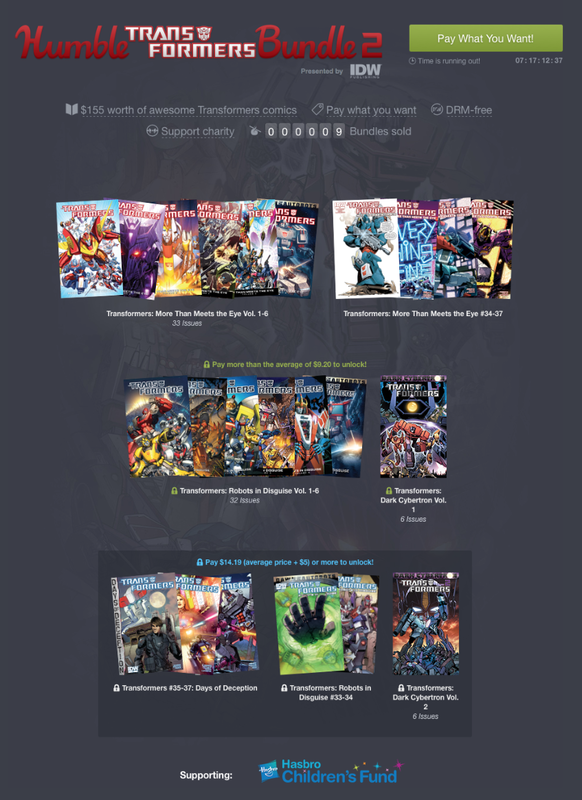 The Humble TRANSFORMERS Bundle 2 Presented by IDW runs from now until Wednesday, March 11, 2015 at 11 a.m. Pacific time.